There is a band on the stage at the Royal Festival Hall, and they look like The Libertines. It’s an uncanny impression. Sure, four of them have gone grey, which leads you to think “Carl Barât”, if that really is Carl Barât, has probably invested in some Just For Men, but if you squint at “Pete Doherty” in his flasher mac, the sullen face of “John Hassall”, the bearded, shirtless “Gary Powell” clicking his sticks to keep the between-song jumble jams in time… yer, you’d start to think that maybe this is actually the Boys In The Band. The good ship Albion, come up the Thames under full sail and docked on the Southbank. It must be The Libertines. It even says so in massive letters above the stage. But… but. It can’t be. Can it? The Libertines were never supposed to go grey. They were never supposed to play the plushest gaff in Londinium, an all-seated space with a sliver of standing-room at the lip of the stage and nothing as plebeian as a crowd barrier. And at the personal invitation of one of the Gods of alternative rock, no less. Some bands run on booze, others on money, adulation or plain old diesel oil. The Libs? You might think they ran on drugs and drama, but you’d be wrong – that’s just the stuff that got in the way. 2002’s grubbiest, most seductive urchins ran on romance and myth, and the myth of romance. Romance generated from the sticky floors of underground indie clubs, and surprise gigs in Shoreditch squats. From poetry on web forums, rendered in scrappy HTML, and photocopied fanzines done for retro appeal. From a tangible energy generated by their two frontmen, rubbed together like sticks to spark flames. Their implosion after 2004’s self-titled soap opera soundtrack should have sent them flying back in time, if anything surfacing mysteriously in spotted footage of the 70s pub rock scene, or faded photos of Edwardian music halls. The Libertines should have evaporated inside the myths and the romance that powered them. That’s the story you first read in Pete’s bug eyes and Carl’s pout. And yet, here we are, and here they are. Banging out the classics. WHOOSH. There’s ‘The Delaney’. WHAM. There’s ‘What Katie Did’. There’s a trio from their should-never-have-existed and surprisingly robust third album. “Pete” and “Carl” smush faces at the mic, swapping lines and glances and jokes. What kind of twisted indie mirror universe are we even in? Maybe that explains Brexit and why people keep buying Clean Bandit records. “Carl” vanishes behind an upright piano, stolen from a Bethnal Green primary school (this is the Royal Festival Hall, loves, I’m sure they’ve got a proper baby grand you can use somewhere), and “Pete” grabs his acoustic and we’re into ‘You’re My Waterloo’, the one hangover from the bad-old-days that made it onto the comeback record. “You’re not Judy Garland” yearns “Pete”, “I’m not Tony Hancock baby / Until the dawn we’ll stone the crows… we’ll stone the crows”. Suddenly there it is. In that one line. There are the giant Babyshambles posters that plastered Hancock over bedsit walls, there’s the ripple and the glow you remember from the NME website reports of guerrilla gigs in the no-mans land between Libertines records when we thought we’d had our lot. There’s the myth again. “I brought you flowers I collected from the Old Vic stage” breathes Pete, and suddenly the stage is covered in flower petals, thrown from the dedicated making up a standing front row this venue technically doesn’t even have. Most of the petals, thrown by the handful, don’t make it very far but it’s enough to make you realise that “Pete” was Pete all along. Myth and romance looking you in the eye. 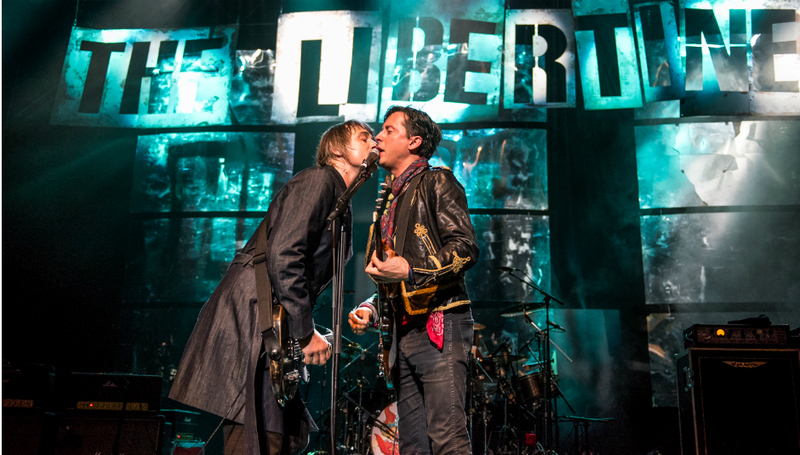 Because this is The Libertines, unmistakably and irrevocably. And if ‘Can’t Stand Me Now’ feels phoned in, that’s fine – Pete manages to bring it to life with a harmonica solo, throwing his mouth-organ into the crowd for a lucky fan to catch, take home, and presumably disinfect. When the other-other-other fab four run through ‘Time For Heroes’, ‘Death On The Stairs’, ‘Vertigo’, and a cover of our gracious hosts’ ‘Boy’s Don’t Cry’, essentially the template for every song Biggles and Bilo ever wrote, they’re no longer a shadow of themselves, a Spock’s Beard mirror image, but the genuine article. You realise why the sound throughout the whole gig has been a bit wonky; drums too loud, guitars too quiet except when they’re suddenly WAY too loud, vocals sometimes lost, guitars clashing out of key. This can only be the Libertines. Back from the Dead and bringing their chaotic spirit with them. Looking back into the sun but somehow facing forward all along. Carrying their romance into the sunset. Stone me.